Crosby Fan World » The Great Jazz and Pop Vocal Albums. What? No Crosby? Unbelievable. » The Great Jazz and Pop Vocal Albums. What? No Crosby? Unbelievable. The Great Jazz and Pop Vocal Albums. What? No Crosby? Unbelievable. Forthcoming book entitled "The Great Jazz and Pop Vocal Albums" by Will Friedwald, according to the blurb, covers Ella Fitzgerald, Frank Sinatra, Peggy Lee, Sarah Vaughan, Nat King Cole, Judy Garland, June Christy, Cassandra Wilson, Tony Bennett, Louis Armstrong, Oscar Peterson, Doris Day, Dinah Washington, Maxine Sullivan, Margaret Whiting, Jo Stafford, Lena Horne, Kay Starr, Carmen McRae, Jimmy Scott, Della Reese and presumably others not mentioned in the blurb. Might someone be missing? Re: The Great Jazz and Pop Vocal Albums. What? No Crosby? Unbelievable. One of Will's favourite albums is Bing with a Beat so hopefully that will be mentioned. 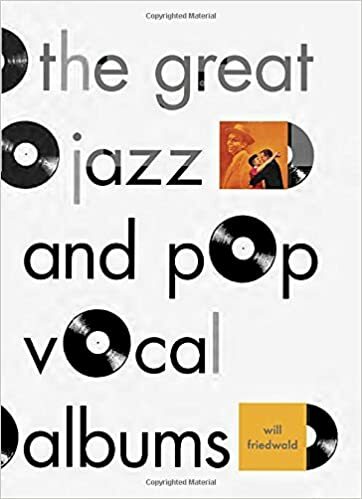 I am really looking forward to this book by Friedwald, who is one of my favorite vocal jazz and classic pop critics, author of wonderful books like Jazz Singing and his massive Autobiographical Guide. Jazz Singing has a whole chapter devoted to Bing and Louis Armstrong and their unique contributions to jazz and pop, and somewhere in there, Friedwald says that Bing with a Beat is one of his desert-island discs. It's probably for that reason that there will be a chapter of this new book devoted to Bing and Satchmo, the full-length collaboration between the two. If you click on the cover of the book on Amazon, where it says "Look inside," you will see the table of contents, and one of the chapters is about that record. Well. that's a relief, Anton. Odd that the publicity blurb, presumably written by uninformed advertising hacks, wholly omit such mention. I agree about Friedwald who is a good perceptive writer.